Duval Democrats and Brenda Priestly Jackson outside the Duval County Courthouse Monday. Scott suspended District 10 Councilman Reggie Brown and District 8 Councilwoman Katrina Brown after they were indicted on a combined 38 charges of federal fraud. Brenda Priestly Jackson is suing the Republican governor and Freeman because at the time of his appointment, he was still a resident of Mandarin in District 6. Republican officials and the city’s general counsel maintain the opinion his council term didn’t actually start until he was sworn in — two days after he was appointed and began renting two rooms in a District 10 home. Jackson disputes this. In a press conference Monday, her lawyer Leslie Jean-Bart said Freeman was a councilman immediately after his appointment. In a written statement to WJCT Monday, Scott’s Press Secretary Ashley Cook challenged Jackson’s assertion, saying there was no wrongdoing. “We will review this lawsuit. Mr. Freeman was appointed to serve in his seat on an interim basis due to the suspension of Mr. Brown following serious felony charges. This temporary appointment complied with the law,” Cook wrote. Jean-Bart and her co-counsel Leslie Goller filed the motion asking a judge to speed up the court process and stop Freeman from making any decisions as a council person until the case is resolved. The motion reiterates the lawsuit’s allegation that when the application for the council districts was originally posted online, it included an address verification process. Jackson said that about a week later that requirement disappeared. Now Jackson is requesting public records associated with the application process and wants them fulfilled in the next 24 hours, alleging it’s likely state government transparency laws might’ve been violated. 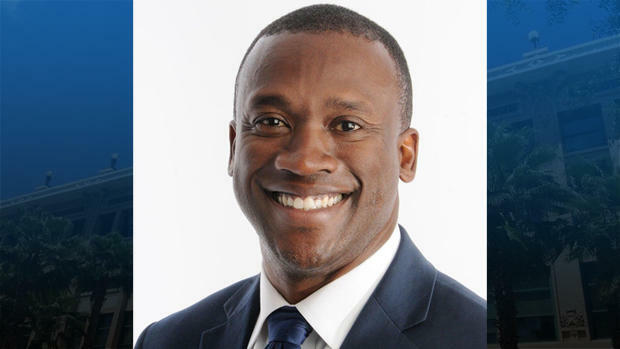 Jackson argues the appointment of Freeman also violates the Florida Constitution’s Fair Districts Amendment along with due process and equal protection. “We are deeply troubled that our governor, in coordination with our mayor, in coordination with our city council president, chose to pick an individual that does not live in our district. As well as an individual that has a close tie to those in office and not the community,” she said. WJCT reached out to the office of Mayor Lenny Curry Monday, but so far has not heard back. Meanwhile, Paul Renner, a Palm Coast Republican state house representative, is representing Freeman in the suit. Renner told WJCT they’d be responding to the lawsuit in court and not in the press. As many times as Monday’s speakers claimed the lawsuit wasn’t partisan, the air of politics was palpable. District 10 is overwhelming Democratic, with only 19 percent of voters registered as Republican. 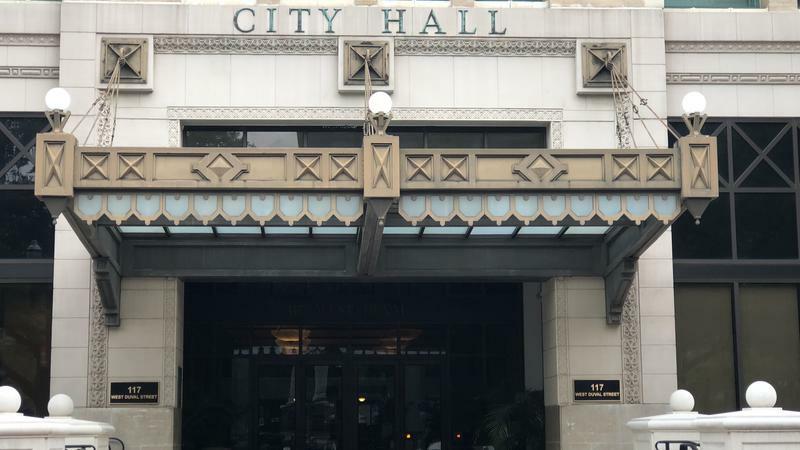 Standing over a lectern displaying the logo of the Duval Democratic Party, Councilman Garrett Dennis accused Mayor Curry of trying to manufacture an edge in council politics. Dennis has been a constant critic of Curry, from discussions regarding the possible privatization of JEA to the creation of the Kids Hope Alliance in place of the Jax Journey and the Children’s Commission. 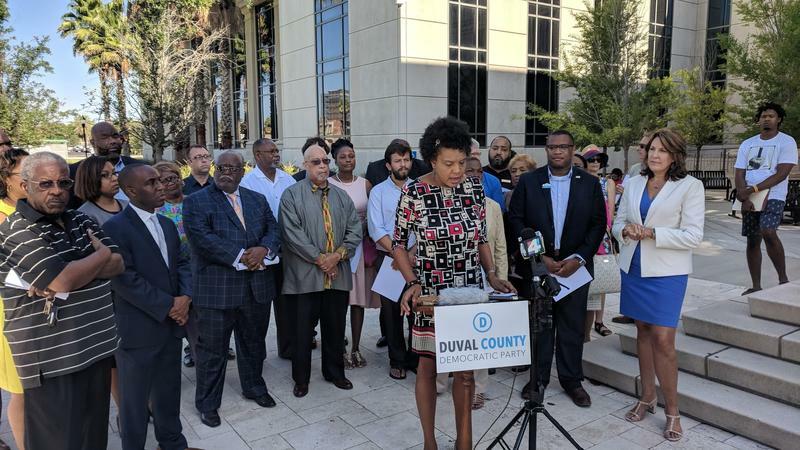 Likewise, State Sen. Audrey Gibson, D-Jacksonville, also accused local Republicans and Scott of “shenanigans” to subvert the county charter’s requirement that council members be continuous residents of their districts. “The real message from this appointment is that the rules only apply to some people and the rest should be quiet and go pound sand. I don’t think so. The circumstances send the wrong message to the people about their government. There’s already a lack of trust. Why should public officials add more fuel to that fire?” Gibson asked. “We urge Democrat Party Chairman Lisa King to end her partisan attacks on Councilman Freeman and instead focus on keeping her own elected officials from becoming felons,” the statement read. If the indicted council members would have resigned, a special election would have been triggered, which would have circumvented the need for the governor’s appointments. The indictments of Reggie Brown and Katrina Brown followed the convictions of former Congresswoman Corrine Brown and former State Rep. Reggie Fullwood, both Democrats. The lawsuit is now awaiting assignment to a new judge. The previous judge hearing the case — Robert Dees — is a recent Scott appointee to the bench.